Via Technologies’ Mobile 360 in-vehicle surround view system was designed for real-time commercial vehicle monitoring applications. It combines up to six camera feeds to create a 360° view and has one CAN channel. The in-vehicle surround view system delivers real-time in-vehicle recording for up to eight individual HD camera streams to provide an effective solution for vehicle monitoring, safety, and tracking. Utilizing Multi-Stitch technology, the system can combine up to six camera feeds to create an encompassing real-time spherical view of a vehicle’s surroundings that can be viewed locally or remotely. With its 3D imaging algorithms, the technology not only ensures crisp and clear panoramic images but also supports dynamic multidirectional monitoring around the vehicle from a range of configurable perspectives, including birds-eye view, front-view, rear-view, and side-view. The system enhances vehicle safety by increasing driver visibility when turning corners, parking in tight spaces, or reversing, and eliminating the blind spots that are commonly found using 2D video monitoring technologies. With its NVR capabilities, the system can also be used to capture and store footage of accidents and security breaches. 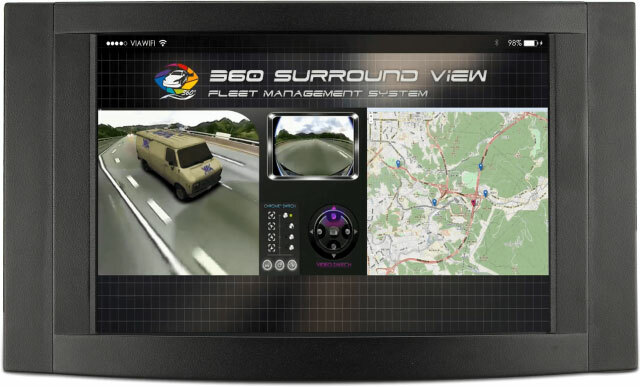 Combining a ruggedized design featuring video processing capabilities and support for multiple camera inputs with a flexible video software development platform, the system can be customized to meet the requirements for multiple in-vehicle real-time 360° video monitoring and recording applications and environments. For connectivity, the system has 1 CAN, 2 USB 3.0, 4 USB 2.0, 1 HDMI, 1 Gigabit Ethernet, and 1 display port. Wifi and Bluetooth are wireless options. The Multi-Stitch technology supports graphics and video processing features, including source calibration, culling, de-fisheye, perspective transform, orientation, repositioning, and side view geometric calibration, in order to ensure high-quality real-time 360° video streams. With its ruggedized chassis, extended temperature support, and flexible voltage input, the Mobile 360 Surround View system has been designed to withstand the rigors of the road. Combining support for up to eight PoE or eight CSI cameras with video processing capabilities, including video encoding for remote viewing, the system has the performance and scalability required for recording and delivering real-time 360° spherical images from demanding environments. VIA Technologies develops integrated embedded platform and system solutions for M2M, IoT, and smart city applications, ranging from video walls and digital signage to healthcare and industrial automation. It is headquartered in Taipei, Taiwan.